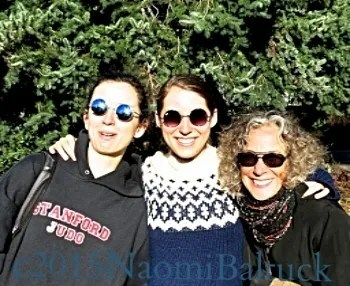 Thanksgiving was extra special this year for three reasons: My sister Constance, my daughter Bea, and Bea’s friend Beata. The week flew by, as packed with good stuff as a holiday fruitcake. 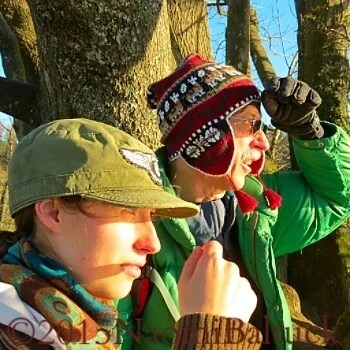 We took a hike at Discovery Park. 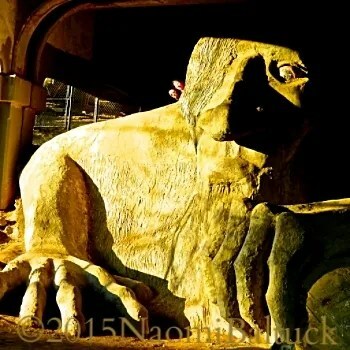 We explored Fremont, a quirky neighborhood of Seattle, and got an eyeful of art, from the giant Troll under the Aurora Bridge…. We also took in free samples at Theo’s chocolate factory, but officially ate at Cafe Turko. 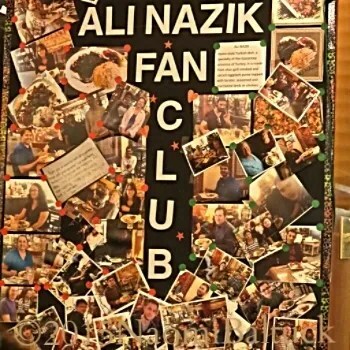 Thom survived Ali Nazik the Fire, a spicy eggplant dish ‘Drizzling with smoky heat…’ which qualifies him for membership in the Ali Nazik Fan Club. 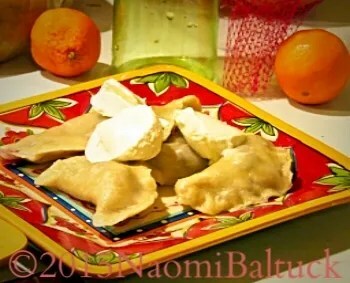 One night Beata and Bea cooked homemade pierogi. They were as scrumptious as they looked! This was Beata’s first American Thanksgiving. We told her everyone in America dresses up, as on Halloween, but in pilgrim costumes. 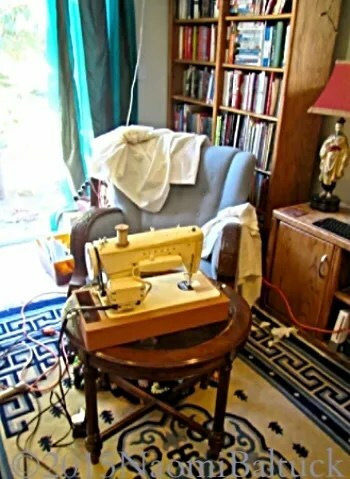 We scoured thrift stores for wooden plates, pewter mugs, and Constance bought a clunker sewing machine for $15. 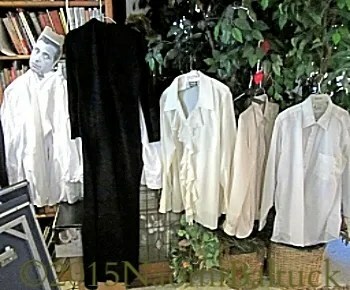 Then she sewed aprons and collars that looked great with white shirts, dark skirts and vests. 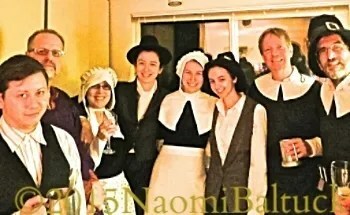 On Thanksgiving, guests who needed help with a costume went downstairs and came back looking like a pilgrim. …in a world lit only by fire. 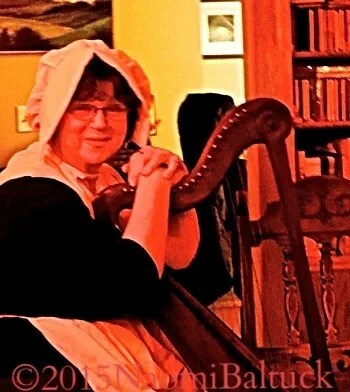 My dear friend, storyteller and harpist Mary Dessein, capped off the evening with stories and song. Is this what the world looked like through pilgrim eyes? Beata told us afterwards that she’d seen too many American holiday movies to believe everyone in America celebrates Thanksgiving in costume, but she did say she thought this was probably more fun. I’m thankful for so many things, but to have twenty-five friends happy to dress up as pilgrims on Thanksgiving Day, well, that’s the gravy! 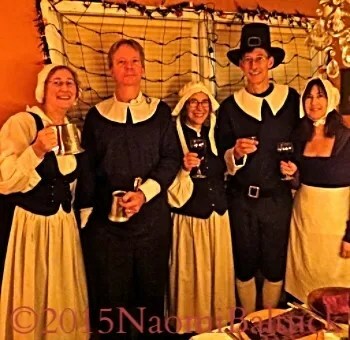 And now that we have a collection of pilgrim outfits, I think we might just do it every year! Click here for more interpretations of The Weekly Photo Challenge: Eye Spy. 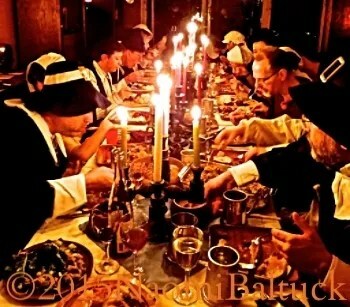 Love the Pilgrim feast photos. What fun! 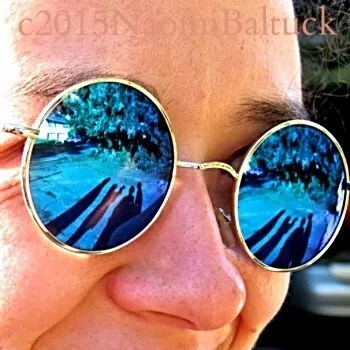 Always enjoy visiting your blog and your sharing your adventures, Naomi. Hi Ruth, thanks so much for the visit. I enjoyed a wander over to your blog too. Have gotten behind, but am catching up! Thanks, Richard. It really was a blast. 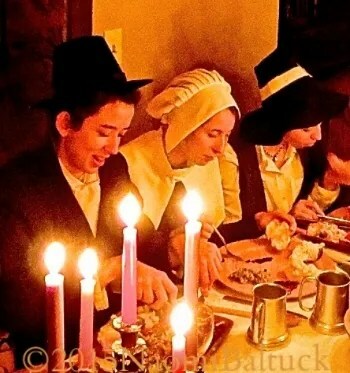 Oh my goodness that would have been so much fun dressing up as pilgrims for Thanksgiving! I’ve always wanted to do this, and we found the perfect excuse. Now that we have costumes made, we’re set for next year, every year! 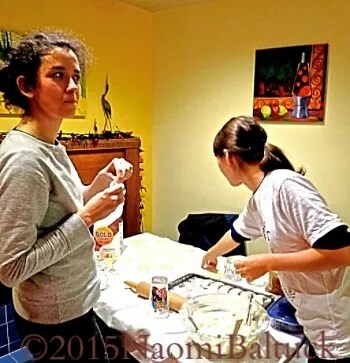 I couldn’t find a place to leave a comment on your blog–I hope your daughter settles into her new adventure, and I will be following her story. My son taught ESL in Argentina, Turkey, and now Mexico, and he is looking at Korea as a possibility. Oh wow he has been all over. My daughter is loving South Korea. I’m sorry you couldn’t find the comment secion of the blog. I’m glad she is like Korea, as that is a destination under consideration for next year. Thanks for stopping by, Lisa. It was one of the best Thanksgivings I’ve had. Having my sister there always makes the difference. We have so much fun together. I enjoyed a wander over to your blog–you are involved in so many good things! Naomi, This is wonderful! I am still chuckling! Hi Michael, thanks for stopping by. I enjoyed the story of your Thanksgiving too! It is my favorite holiday. Thanks for the visit, and the kind word. We always manage to find some fun around here. Wishing you a wonderful holiday season! Another fabulous festival! I suppose you told Beata that American families typically dress as pirates for Christmas, didn’t you? I can back you up on that one with photos! I’d love to see those photos, Priscilla! Actually, when I heard that Beata was coming for Christmas, I told her that in America everyone dresses up as elves for Christmas, but I don’t think she’s biting. But she will be here to celebrate with us. Last year Bea and Uncle Lew both wore their Star Trek pajamas on Christmas morning, and I have photos to document the day, but I don’t see that happening on a grand scale either! Thanks for stopping by. It’s always good to hear from you. You and your family have the most magical minds! You make memories in a way no one else can. Thank you for your visit. I think it takes one to know one, and I can tell from your wonderful family photos and travel stories–I still recall the one of your daughter seated cross-legged in the middle of the highway ( was it in a meditation pose)–that you and your family have a similar talent! Thanks so much for the visit–it’s always good to hear from you. Wishing you and yours all the best as you continue to make memories as only you can. I am so fortunate to have such a playful crowd of friends! It was really fun putting together the costumes. I already had much of what we needed in our costume room, and Con is an expert and improvising. Thanks for the visit; it’s great to hear from you. I do so wish you lived closer! After Nancy sent me photos of the improvised Halloween costumes that you all put together, I thought, “It must be in the blood!” This is the first Thanksgiving in years that we have celebrated without Nancy and Ian, who are some of our most fun and enthusiastic party people. We all miss her and are looking forward to a visit from her in January when she will be here to take care of house matters. She will just catch Bea on the night before she returns to school, but both kids are eager to see her. Did Nancy tell you that we are cousins on both sides of the family? We are related through Reuben on the Aptekar side, and descended from Mayflower pilgrims John Howland and Elizabeth Tilley too! HI Chris, Thanks so much for the link-up. I loved your interpretation of the theme! It’s always a treat to visit your site. 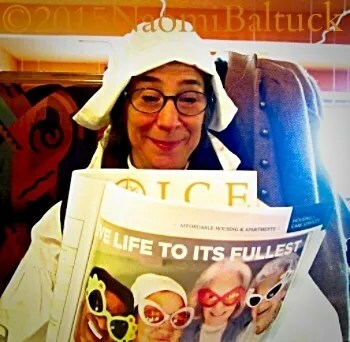 Looks like so much fun,Naomi! I was just thinking about you, so it’s especially good to hear from you! I hope you are well! Best wishes for a warm and wonderful holiday season. Well, wow! You know how to organise a festive celebration, that one will go down in all memories concerned as one to remember I am sure! Well done you all. Thank you, Claire! 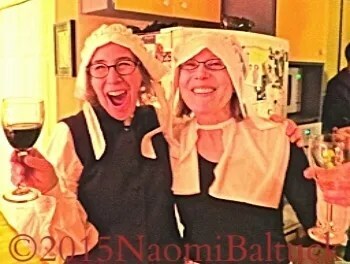 I have always wanted to have a costumed Thanksgiving, and it was so much fun. Now we have all the costumes and dinnerware, that I don’t see why we shouldn’t do it every year. Thanks so much for the visit, and the kind word. Best wishes for a happy holiday season! Thanks, Dianne. It was the best Thanksgiving ever! So good to hear from you! Looking forward to reading your new release! HI Carol, I’ve always wanted to do that, and Beata’s presence provided the perfect excuse. Now, having done it, I can’t imagine ever going back to civilian togs! Thanks for the visit. Happy to hear your story. Do you do Santa hats and ugly Xmas sweaters too? Hah! We have to draw the line somewhere, Carol, and that’s as good a place as any! 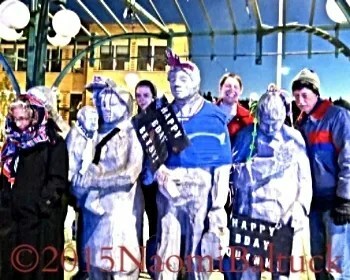 You all sure know how to celebrate, Naomi! It looks like a great time was had by all. Fantastic photos! 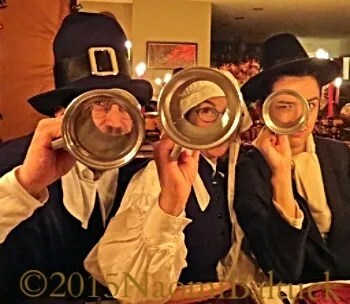 That looks like so much fun to dress up for Thanksgiving – a definite tradition in the making!! I’ve never had so much fun on Thanksgiving. I can hardly wait until next year! Thanks for the visit, and for sharing a kind word. What a wonderful way to do Thanksgiving! I love all the pilgrim costumes. You guys are always so creative! Thanks for the visit, and the kind word. I hope you are well. Where in the world are you these days? Just went to Oahu with you on your blog! Thanks for being a part of my world. Your stories and music were a highlight, the perfect end to a great evening. See you soon! You are with us in more ways than you know. I still sometimes wake up in the morning and think,”I wonder if Meg’s up yet.” You’d have loved it, being a party person too. Remember setting up for parties at the Forest Festival every night? You are a natural! 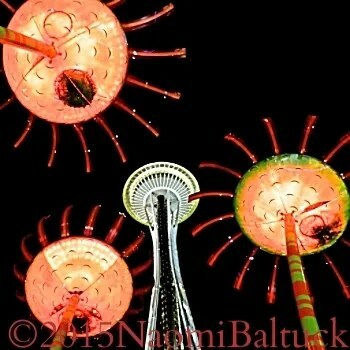 Thanks so much for the visit, both in Seattle, and on the blog. Cheers and lots of love to you to, Meg. Thank you, Gilly! It was so very easy, too! Thank you for the visit, and the kind word! Thanks so much for stopping by–it’s always good to hear from you. Oh, yes! I can almost smell the candle wax now. And power outages in the daytime were indeed a waste! WOW, can I come next year. Can’ t sew or play the harp but can eat chocs! You would surely be welcome, Jean! I’m so glad that you could come and celebrate with us. You made a great pilgrim. You are great hosts Naomi. If ever I get to enjoy flying I’d be in Seattle like a shot. Looks a fascinating city for the curious. I hope you do take up flying again. 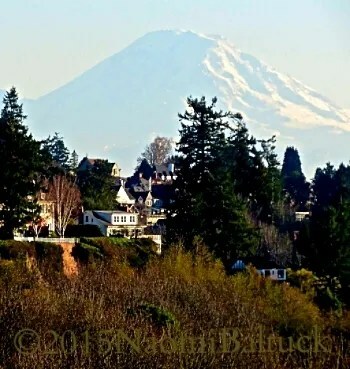 Seattle is a great city, and there is something for everyone here. I would take you around and show you the sights, the way you did for Constance and me. You never know Naomi. Best wishes to you and your lovely family. Fingers crossed! And I will pass on your good wishes–and send the same back to you and your daughters. I wish I was at your house on Thanksgiving!! Fabulous post Naomi! I’m sure you would have brought some great energy into the gathering, Cybele! Looks like a wonderful time with family and friends! The best way to spend the holidays!! So good to hear from you. Thanksgiving is my favorite holiday, with family and friends coming together and none of the frenetic shopping or worries about whether someone will like their gifts, just being thankful together and appreciating each other’s company. I hope you had a Happy Thanksgiving too! Thanks for the visit, and for sharing that lovely thought! Happy New Year! You almost look the part in your costumes, but for the spectacles and your jolly faces! I’m not sure how jolly the pilgrims were allowed to be, lest they indulged too much in earthly frivolities. Never mind, I guess as it was in aid of thanksgiving, it was allowed! 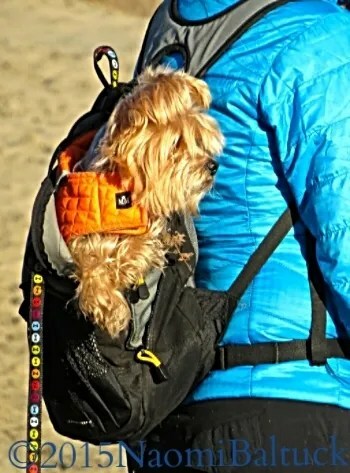 I love that funny little dog in a backpack. When I had a pug, I tried carrying her that way, but she wasn’t impressed. Funny about your little pug! I used to carry Eli that way, but he didn’t mind. I hope your Christmas was merry, and wish you all the best for the New Year! I used to carry my son in a front carrier, but his legs got too long in the end, so they overlapped the top of my legs and it became a bit difficult for me to walk. He wasn’t so keen to be carried on my back. For some reason he didn’t feel so secure. My Christmas would have been merrier if I had’t had the remnants of a cold and no singing voice for all the festivities, plus every time anybody made me laugh, I collapsed into a coughing fit. I didn’t dare watch a comedy series on TV that I’d recorded, for fear of laughing too much! Oh, dear! I know how much music means to you, too. I had a cold as well, and on Christmas Eve I sent the family around the corner to my mother-in-law’s, because she is avoiding germs of all kinds. They came home and we had a nice dinner and made delightful music (that would’ve chilled the blood of a really skilled musician like you), and I squeaked out a few notes and played the jingle bells when my voice gave out. I hope you are feeling better! Today is my first day of getting better instead of worse, and Bea, who caught the Christmas bug, is feeling better too. There is a bright side to all this pestilence: after lovely day, I sent them back to my mother-in-law’s on Christmas night and while the family was gone, I was able to toss all their stuff into their rooms and the house has never been so tidy on Christmas! Wishing you a swift recovery, and a very happy New Year with lots of cough-free laughter! Happy New Year, Sarah! Blessing upon the head of the son who hoovers! Wishing you all the best kind of sparkly throughout the New Year! Sounds like a great idea, Karen 🙂 Almost finished my chores and my son’s in the kitchen cooking so I’m popping round with Christmas love 🙂 Very best wishes to you all for 2016!